In 647, an emissary from Gapi, a kingdom in northern India, presented a plant called “yu gold aromatic” (yu jin xiang) to the court of Tang (618-907). The foreign herb flowered in the ninth month of the year, with the shape of a lotus. The color of the flowers was purplish blue, and their fragrance could be smelled over tens of paces. This account comes from a tenth-century institutional history of Tang (Tang huiyao), in a section that reviews a list of plants and animals submitted by the foreign countries to the Tang. The event took place at a time when the Tang was ascending to a powerful and cosmopolitan empire, expanding its territory into Central Asia. As a result, the period witnessed a vibrant material exchange between China and India, Tibet, Persia (and from the mid-seventh century on, the Arabic empire), and even as far as Europe (see Edward Schafer’s classic work on this topic, also see an earlier post). Saliently, a wide array of foreign aromatics entered China, such as aloeswood and camphor from Southeast Asia, frankincense from India, and myrrh from Persia, which greatly enriched Chinese pharmacy. What then is “yu gold aromatic”? Most likely, the name refers to saffron in medieval Chinese sources. “Gold” (jin) probably specifies the color of the flower, and “aromatic” (xiang) naturally points to its characteristic smell. Intriguingly, the word “yu” conjures up a fragrant herb in ancient China, which was used to scent ritual wine. Therefore, medieval Chinese writers took a familiar word from the past to name a foreign plant thereby readily integrating it into their own cultural terrain. Not surprisingly, the earliest account of saffron in Chinese sources identifies the herb as a wine-scenting agent. According to a third-century text on natural history (Nanzhou yiwu zhi), saffron grew in Kashmir—still a major site of saffron production today—where local people offered its fresh flowers to Buddha whilst collecting the withered flowers to make fragrant wine. In the following centuries, saffron entered China either as a diplomatic gift (shown in the opening story) or as a commodity of trade. It was an expensive substance due to the intense labor involved in harvesting the three red stigmas of each flower. To obtain one pound of saffron, based on one estimation, seventy thousand flowers must be manually collected. This “circumstantial rarity,” to use Paul Freedman’s term, has made saffron one of the most costly spices in the world. How was saffron used in medieval China? Noticeably, it became a powerful antidote. According to the eighth-century pharmacological work Supplement to Materia Medica (Bencao shiyi), saffron can dispel all types of noxious odors. Often mixed with other aromatics, it can eliminate malignant qi and demonic possession in the body. Later medical texts (Fig. 1) make it explicit that the fragrant plant can counter all poisons, highlighting its antidotal value. In addition, saffron appeared in Buddhist healing rituals. In a seventh-century scripture titled “Sutra of Golden Light,” we encounter a recipe of thirty-two aromatics (saffron included) that promises to cure all disorders and ward off adverse influences (Fig. 2). In particular, the recipe recommends that the aromatic mixture be employed to cleanse the body, with the following instruction: on the eighth day of the month, take an equal amount of each aromatic, pound and sift them, and collect the powder. Next, cast a spell on the powder for one hundred and eight times before adding it into water to wash the body. Situating drugs in a proper ritual—in this case an incantatory performance—was vital for their efficacy. Figure 2: A recipe of thirty-two aromatics in the 7th-century Buddhist text Sutra of Golden Light. The purple box highlights saffron, written in both Chinese and Sanskrit names. 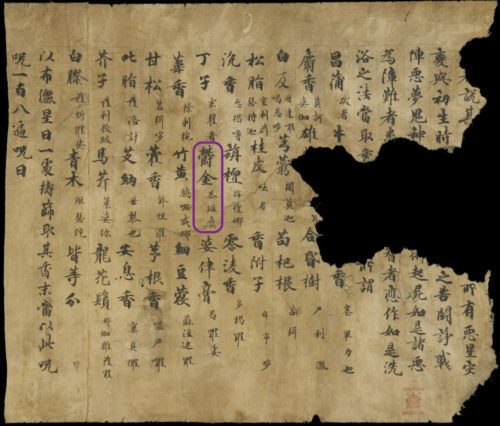 Dunhuang manuscript S. 6107. Image courtesy of the International Dunhuang Project (British Library). Given its strong scent, saffron was also used as a perfume in medieval China. The seventh-century medical work Essential Emergency Recipes Worth a Thousand in Gold (Beiji qianjin yaofang) by Sun Simiao, for example, offers a number of recipes to perfume clothes. One utilizes eighteen aromatics including frankincense, clove, aloeswood, musk, and saffron. Upon pounding into powder, they are mixed with boiled honey and jujube, and made into pills. Burning these pills creates vapor to scent clothes. Due to the high price of saffron at the time, it is conceivable that only the wealthy elites could afford such a perfume. Consistent with this, several Tang poems associate saffron with the sumptuous clothes of elite women. The scent of the exotic flower became a sign for patrician beauty. Finally, I must say a few words about saffron as a spice in China. This is the primary function of the herb today, especially in Indian and Middle Eastern cuisine. It also constituted the chief use of the herb in medieval Europe, for enhancing the flavor and color of food. Yet the culinary use of saffron was minimal in medieval China; we have to wait until the 14th century, when China was under Mongol rule, to see the use of saffron as a spice, especially for preparing meat dishes. This practice, though, remained marginal in the following centuries. Today in China, saffron, curiously called “Tibetan Red Flower” (zang hong hua), is harnessed primarily as a medicine, not as a spice. Why? This is a fascinating puzzle that awaits further research, which invites us to ponder the untold journeys from smell to taste, from medicine to food, from the exotic to the familiar.